We’ve followed the Farina story for a few years so the callout for enthusiastic photographers was too tempting a carrot to resist. Timing fitted neatly around our other life commitments and soon enough we were inducted into volunteer registration, supplied with background information and image transfer processes ready for an adventure. A gentle drive up from Adelaide and overnight dinner and catch up in Quorn delivered a frozen car windscreen next morning and a warning of potential nights to come. 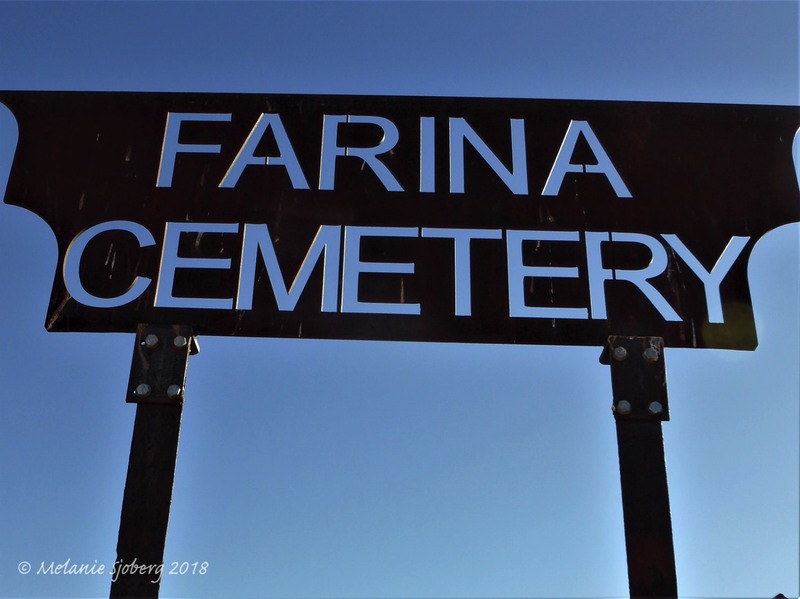 A relatively short road trip through Lyndhurst to refuel found us arriving along a stretch of unsealed road at the sign to turn into Farina. Already wide-eyed at the stunning mid-afternoon scene, we wandered, keen as mustard, into a buzz of activity and newly inducted Team Leaders talking us through the safety induction and directions to the volunteer campground. Well that was the first surprise! 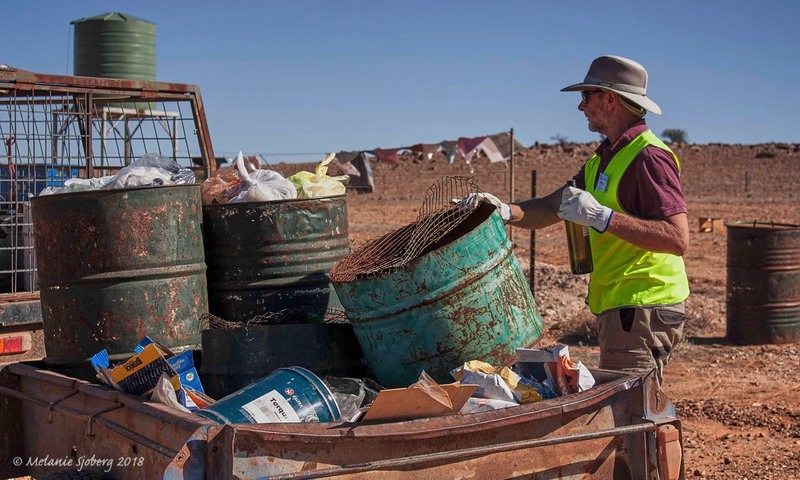 Here we are in outback desert country as experienced bush campers, capable of sustaining ourselves with solar power, care with water supplies and occasional composting or hole-digging process to dispose of personal sewage. 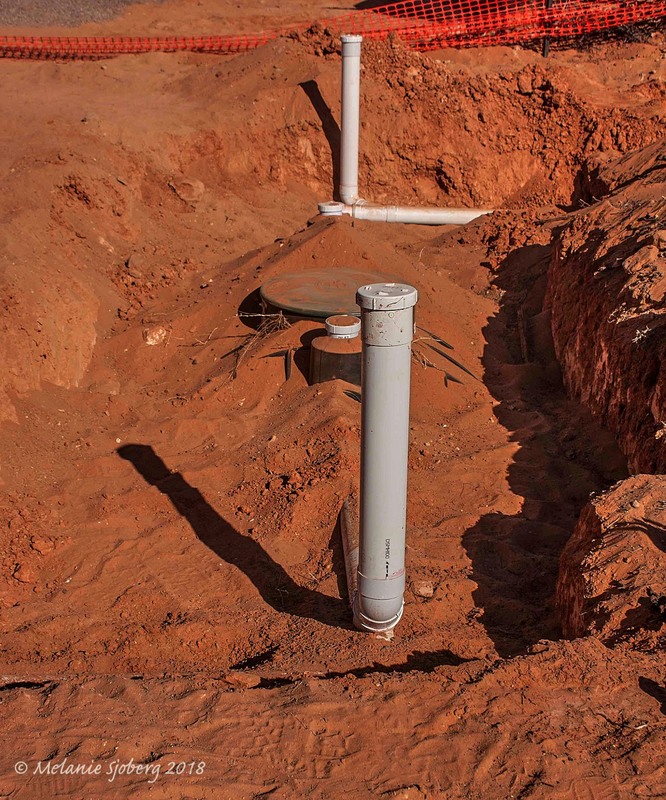 But lo…the campsite offers ablutions with flushing toilets, hot showers – albeit salty bore water – and adjunct generator power if needed. The site was scattered with caravans, campers and tents along the creek bed, amidst rare low trees and along the fenceline; so we found ourselves a level space to settle for 2 weeks. It didn’t take long for the birdlife to attract our attention chirruping between the saltbush and drying seedpods on the local eremophilia: weebills, grasswrens, and honeyeaters compete with the wagtails and pigeons. Before we even contemplate getting to work, there is entertainment thrown into the mix. 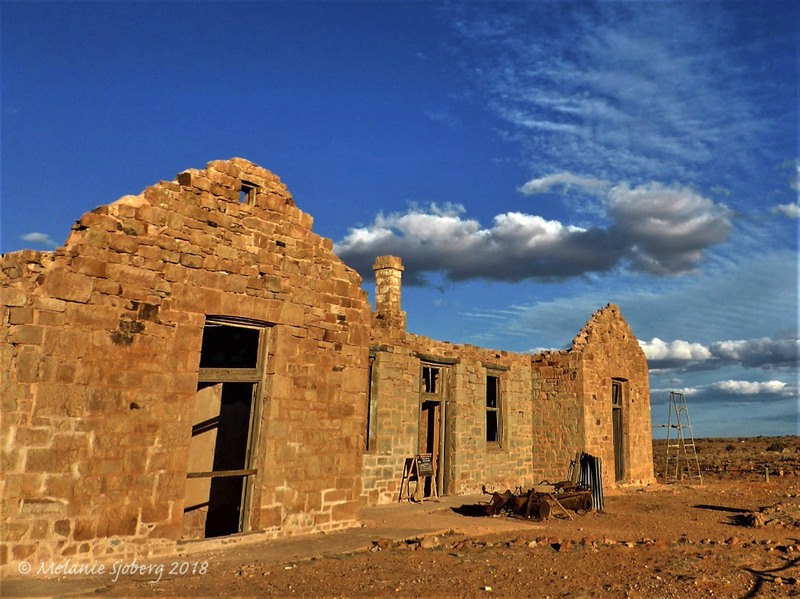 Jessie Budell of the Adelaide Conservatory of Music has spent many months around Farina, working with the volunteers and investigating its history and to compose a score redolent of the life in the town. 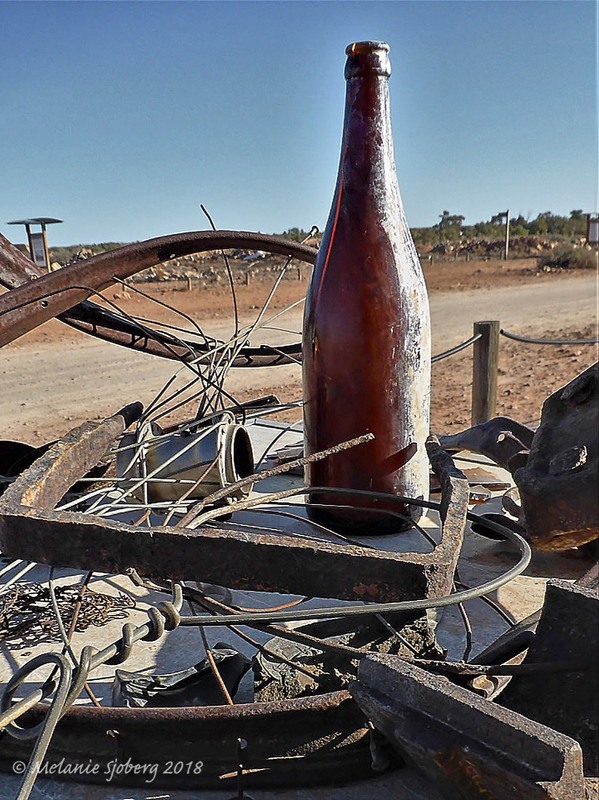 At sundown music and sounds from various rusted tins and scrap, stones, bark and old bottles created an intriguing effect harking back to a life lived around a rail line, dusty streets, pubs and contrasting quiet of the outback. 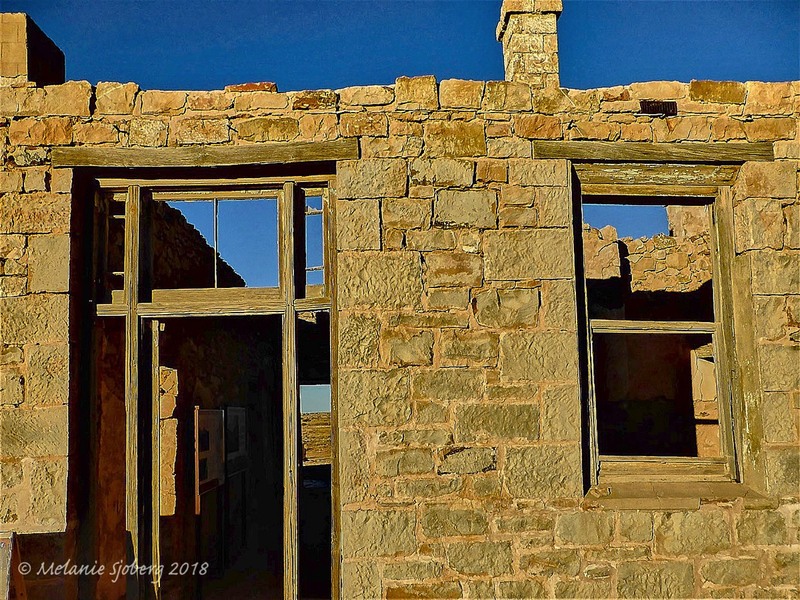 We recommend newcomers take a long slow walk, if possible, around the extended town layout and along trails to soak up the feel of the period and get a sense of the scope of the reconstruction project. The walking trail leaves the campground for a 2km saunter through eucalypts, acacia, native apricot, masses of saltbush, grasses and tiny paper daisies if you look carefully. There has only been 15ml of rain this year so the evidence of drought is visible; piles of dried branches, leaves and general brush lay along the route and occasional kangaroo bones remind you the wildlife are also struggling. Volunteers have installed newly painted and oiled signage so it’s easy to follow along the creek and round to the wells and windmill. 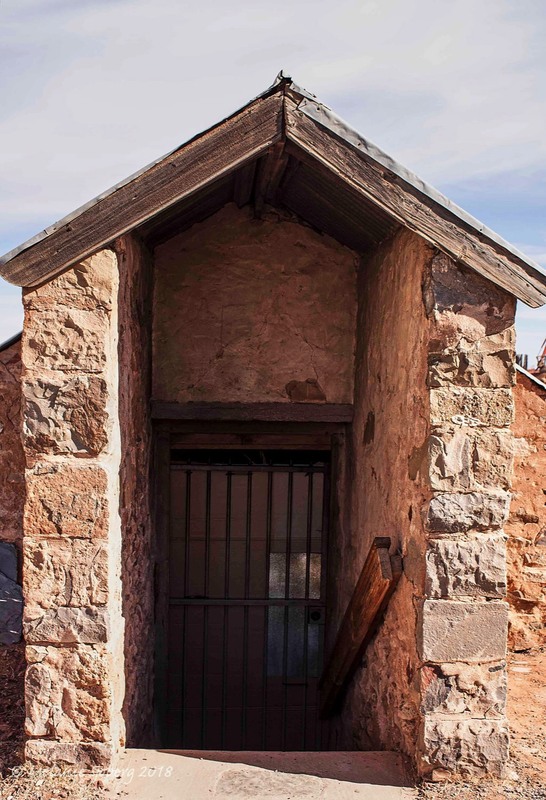 A must for train enthusiasts is a second side trail that takes you under the historic narrow gauge rail bridge to the cattle loading area and rerouting triangle where the narrow and standard rail trains crossed over and turned. Wandering the town streets quickly highlights the importance of the reconstruction activity that is successfully shoring up decaying stone structures of the old post office, hotels and significant buildings, although many of the old town general dwellings have disappeared given they were made of wood, canvas or bits of tin etc. 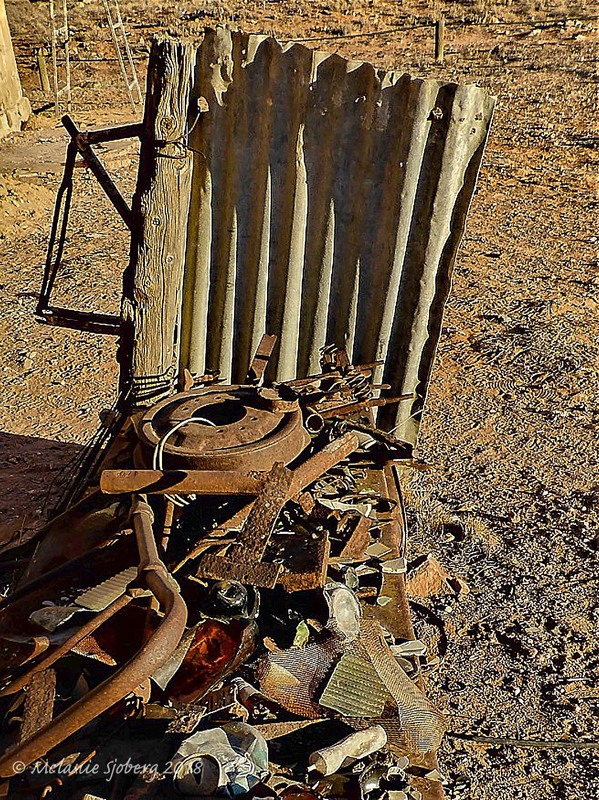 Nonetheless the surroundings are scattered with remnants of an earlier time with assorted objects catching your attention – glass, ceramics, tins, fence posts, rail spikes, bed frames, the odd car shell etc - some are so unusual as to leave you pondering what purpose they might have served. 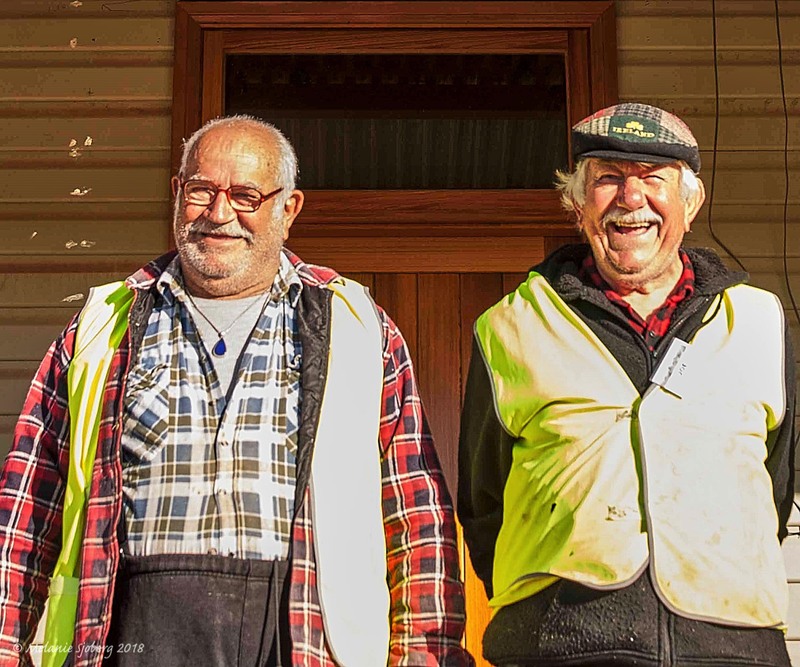 A preponderance of bright yellow Farina vests are a powerful indicator that volunteers are throwing their time and skills into many visible occupations to make mud, point and rebuild the relics of beautiful gold and cream stone buildings; prepare and paint timber paneling; constructing and oiling timber signage; digging, reinstating paving from original slate and grading the streets. 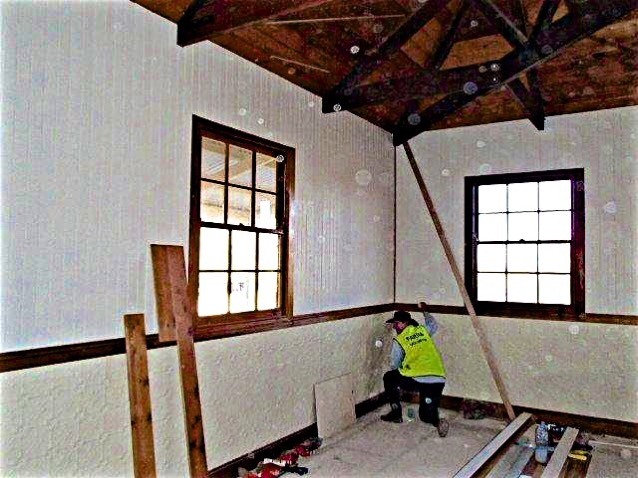 There is enormous effort being put into a special project to rebuild “Patterson’s House” with the aim of respecting the timber panel style of the time and that will eventually become the key focus of an historical display, art, educational sessions and a space to relocate the bakery outlet to stable premises with an operational kitchen. 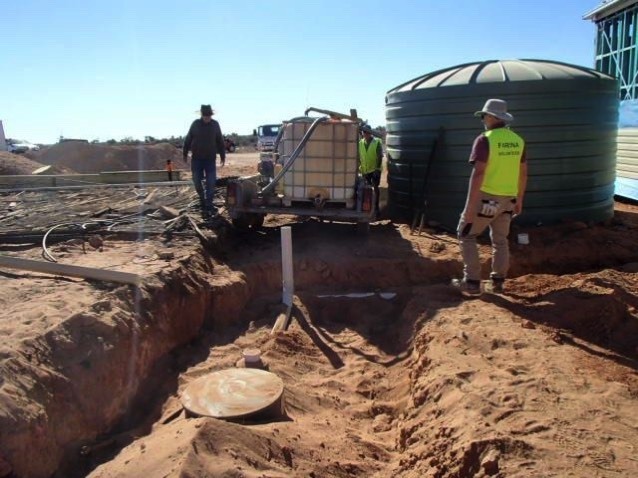 This week tradies and labourers have made a huge effort to dig out holes down to rock layers and lay pipes getting an essential septic system in place for the benefit of future users. Visitors are fascinated by the techniques used in the traditional wood oven underground bakery that is fired up each day before 5am, welcome warmth from the bitterly cold early morning desert. 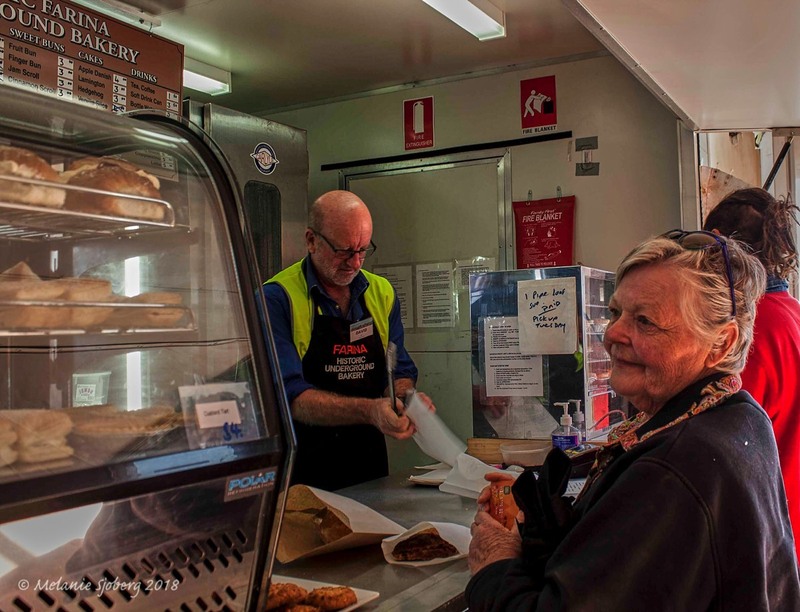 It is apparent that the bakers are the hidden gem starting the old underground wood oven before 5am - welcome warmth on the cold desert mornings - to ensure there are fresh hot loaves, pies and a delicious array of buns to tempt the tastebuds. 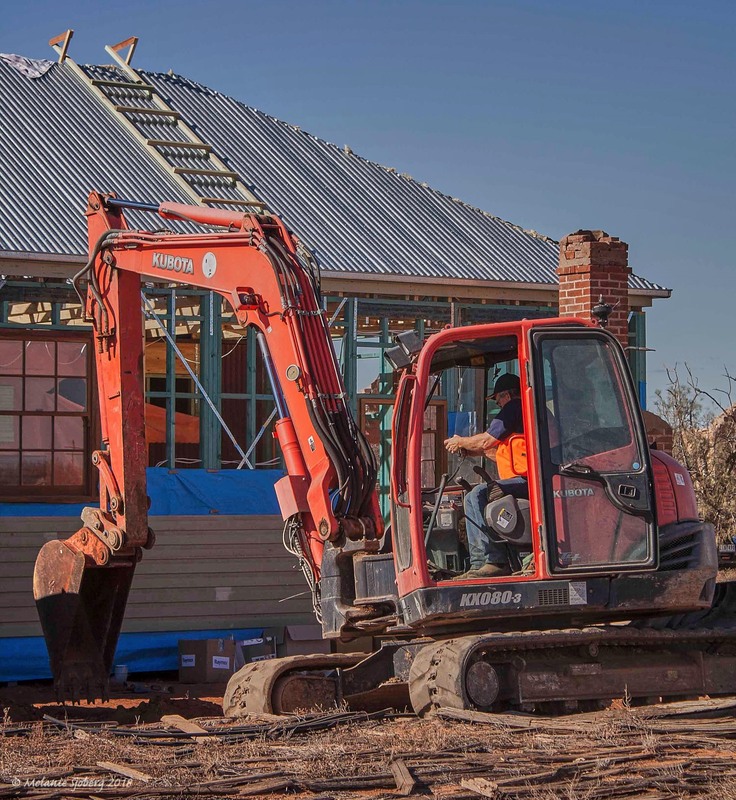 Luckily these attractive goodies are hard for bush campers to ignore as the funds make a valuable contribution to the rebuild. It didn’t take long to realise, however, that a diverse range of activities are necessary to keep the volunteer community functioning in the same way that the people of old Farina would, out of necessity, have needed to organise their lives. Like any little town the hidden work goes on: volunteers take turns to collect the garbage; separate bottles and cans; clean and empty the toilets; refuel generators; keep the “donkey” fire going for hot water; launder the bakery linen; staff the bakery shop and offer a friendly smile to the many visitors that stream through. 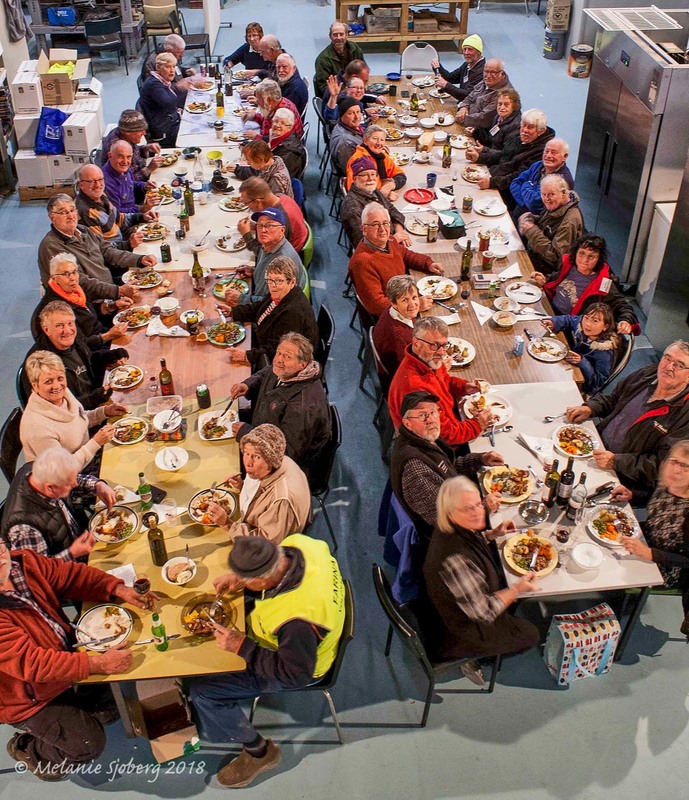 Huge cheers and applause vibrated around Tom’s shed as the volunteers celebrated at the Wednesday night roast. Tim, the current team leader, and Steve the project coordinator, announced significant milestones on the Patterson House project. 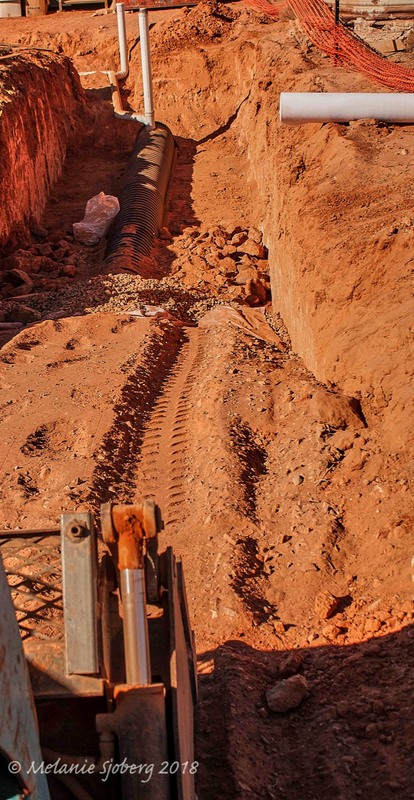 Volunteers have been putting in a massive effort to excavate down through the softer sandy soil to pretty much hit rock but success as it delivered a hole sufficient for the team to install pipes and septic tank ready for use once the Patterson construction is concluded. Steve also announced that with valuable skills from Shane the plumber, they managed to install the box gutter between the twin roofs of Patterson’s, and so joining 2017 with 2018 project advances. 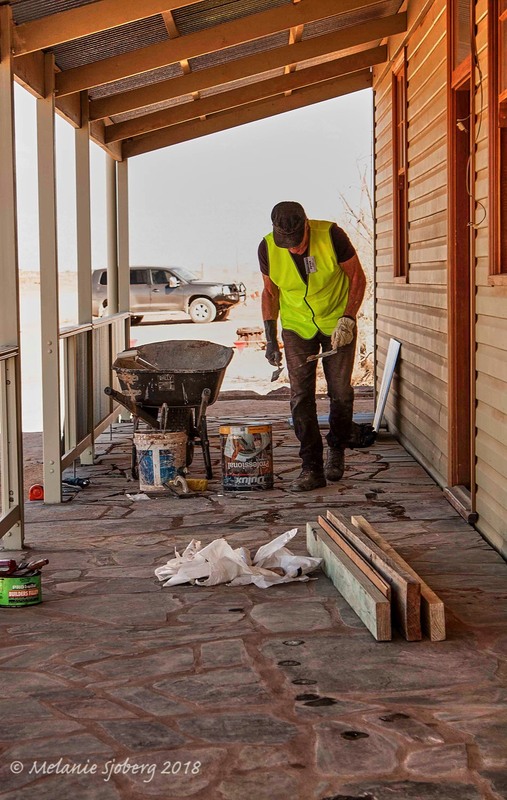 Similarly, the slate paving along the front verandah is progressing sufficiently to appreciate the impressive visual effect. Steve also outlined the important installation of a solar security system to protect the building during the off season. 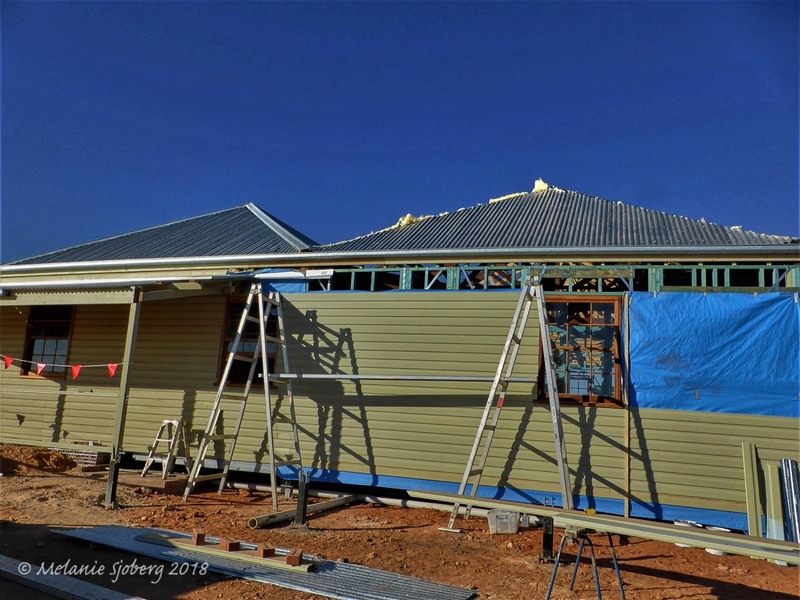 These stages, along with the jarrah doors and window frames provide a drawcard for visitors to stop and chat about developments in the project. It is surprising how often people indicate that they are repeat visitors and have cause to proclaim admiration for progress over the years. Needless to say the bakery is still described as a serious incentive to stop in for fresh goodies so far along the desert track. 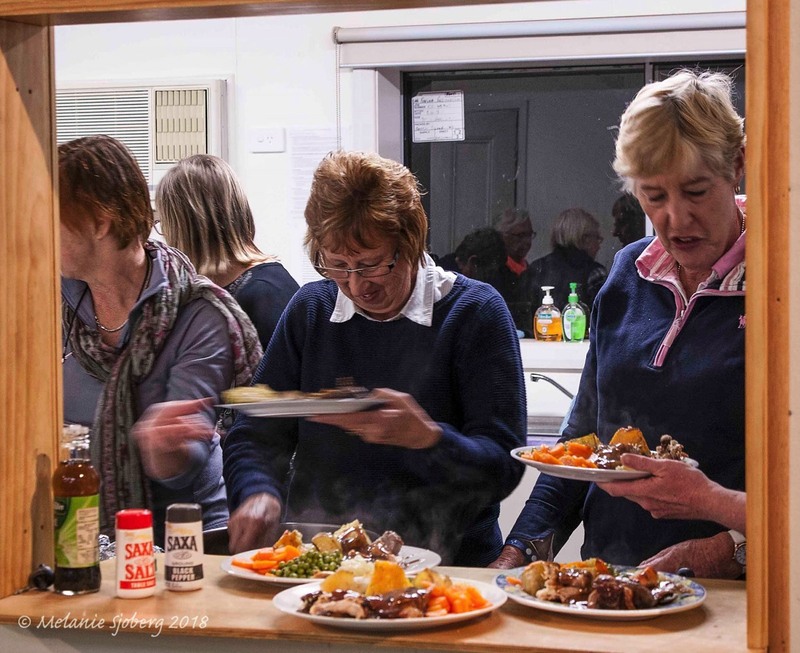 The roast meat and vegetable accompanied by bread and butter pudding went down well after some seriously beneficial efforts on the restoration over recent days. The external cladding on the Patterson building is now going on. The carefully laid slate is now being grouted in. Jack working on the barge boards. The "mud maker" takes a well deserved break. Drink too much and write off the bike! 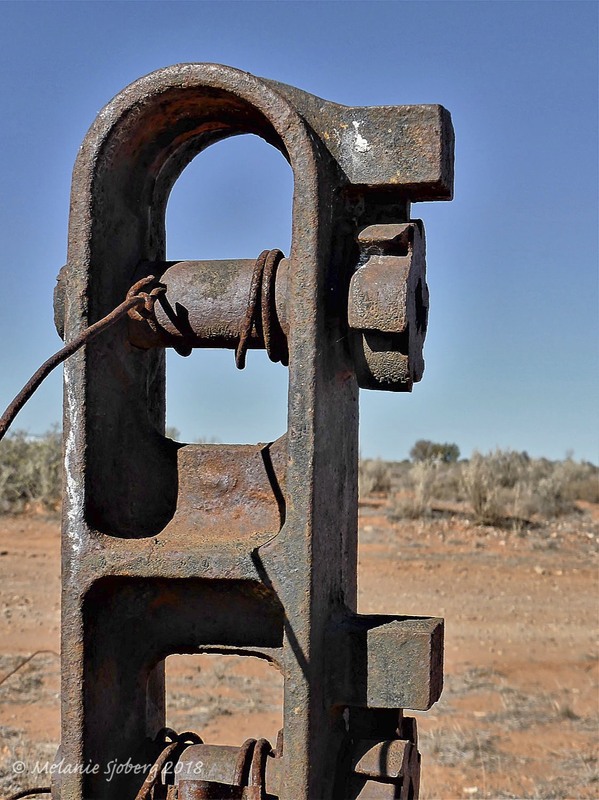 Railway fence wire strainer post. Another bike propped up behind the fence. 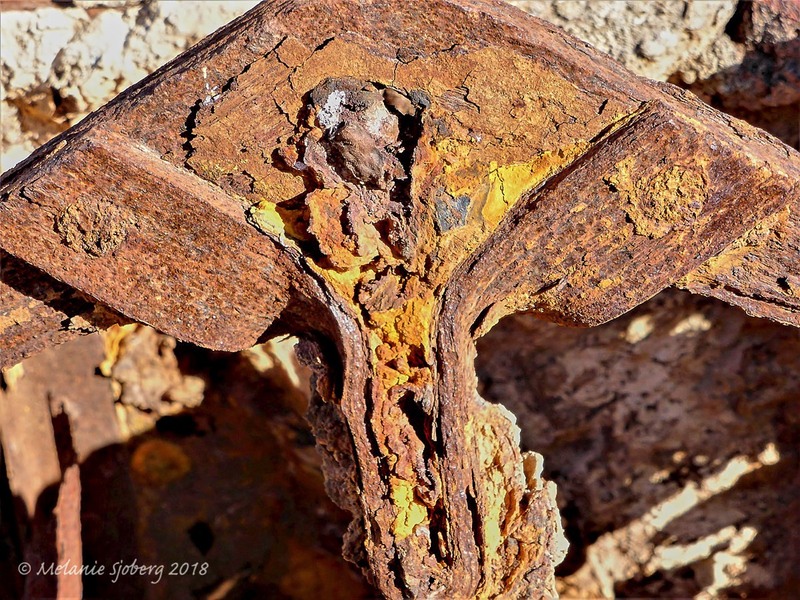 Whatever - the dreaded rust always seems to be the winner. 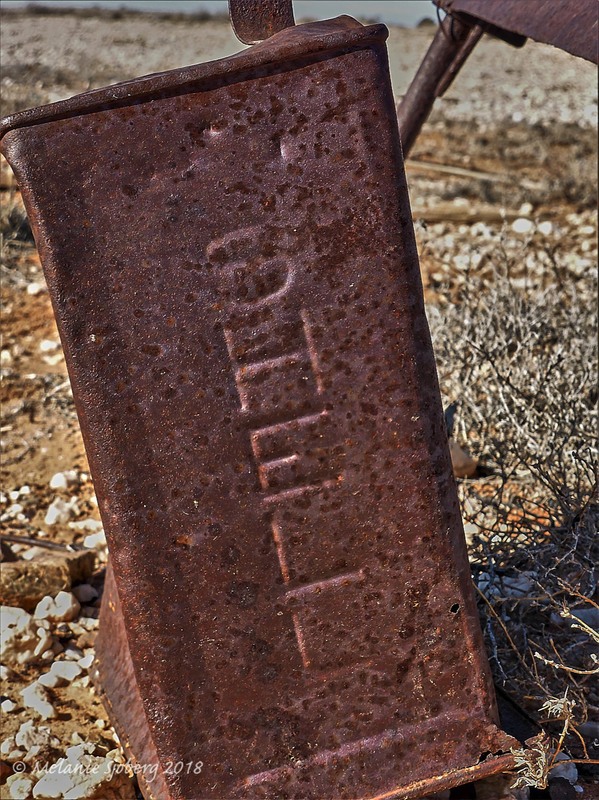 A Shell Oil Company fuel can. 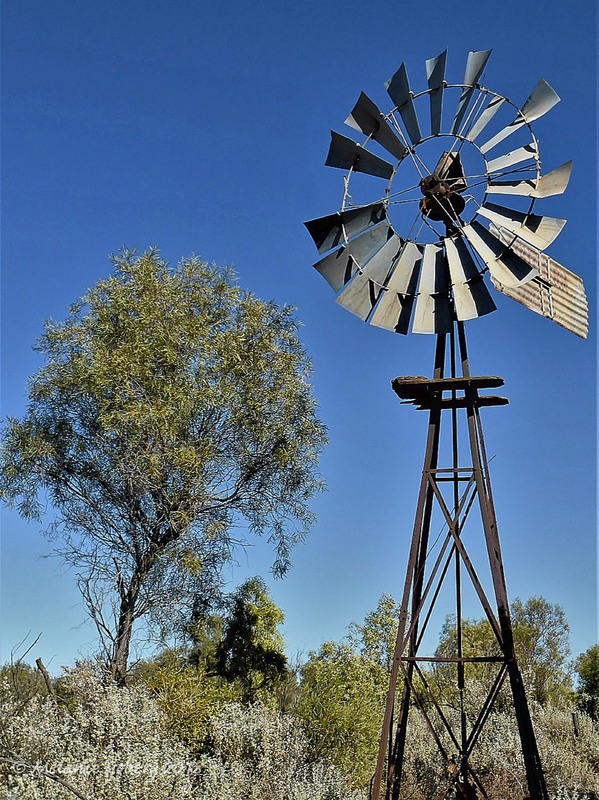 This windmill sits over one of the original wells down by the Leigh Creek which runs past the camping grounds. Stark reminder of where we are. And so the town died! 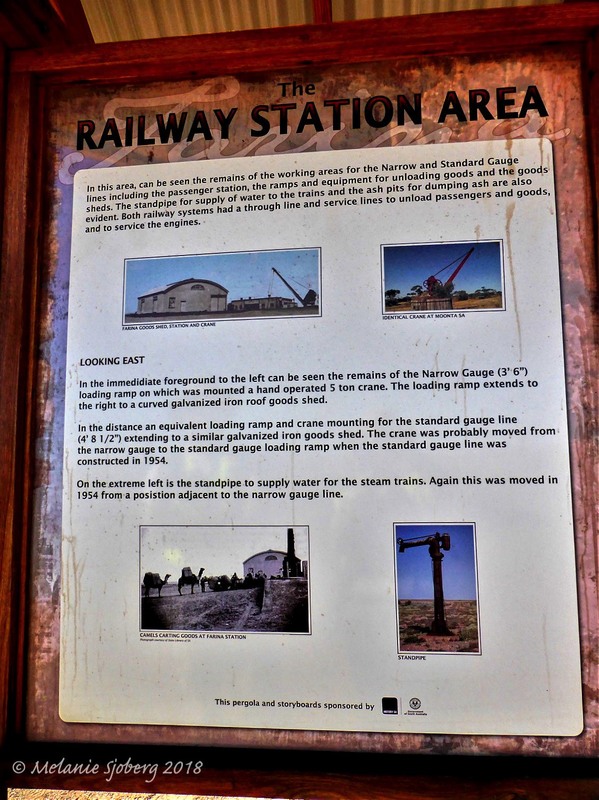 Some of the signage near the railway precinct. On the small outcrop next to the camping ground. Front wall of the Transcontinental Hotel - currently being worked on. Ah! that's more like it! Note the average age of all these enthusiasts. Excavation behind Patterson's for the septic tank. All done, waiting for final cover. Wednesday night camp roast server. 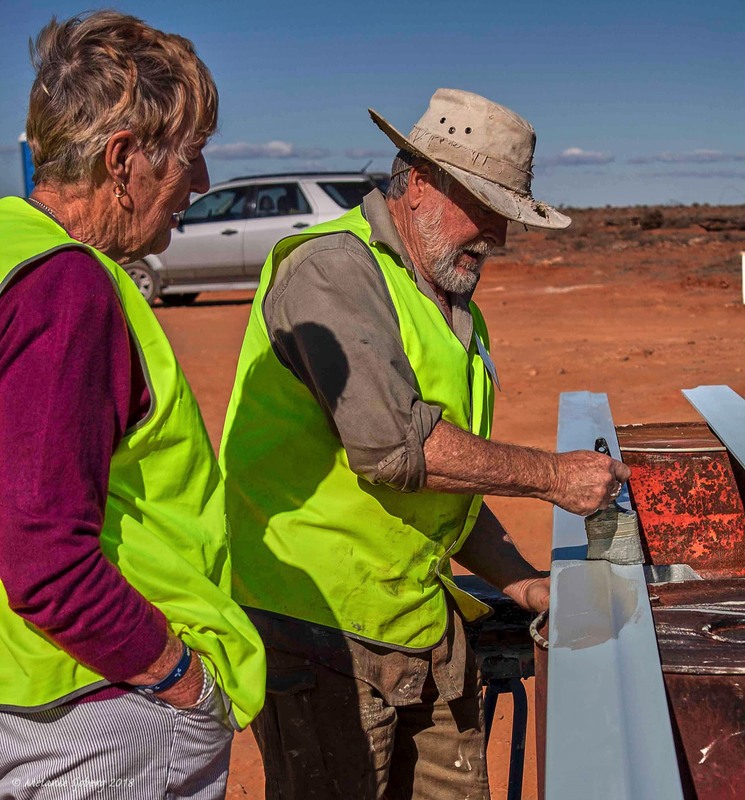 A new week has begun with an influx of volunteers setting up their campers and caravans before launching themselves into Farina activities. Given the exponential increase in visitor numbers, this is a welcome boost to those who’ve been on site for a while. 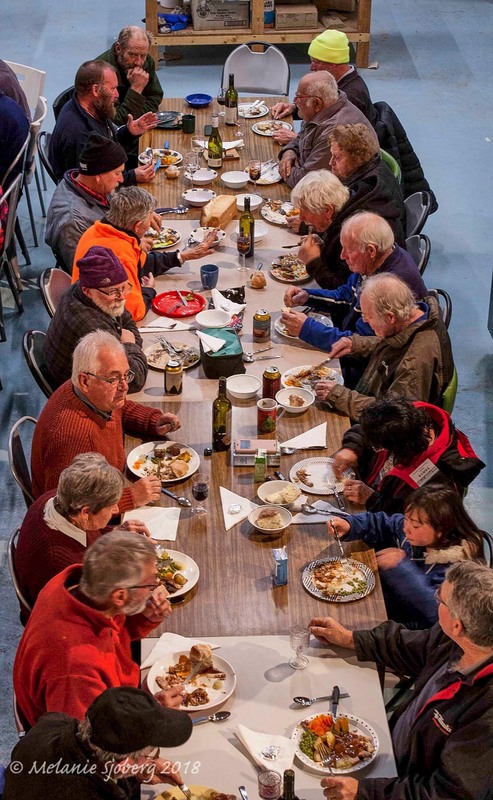 In our human hierarchy of needs, food and shelter are fundamental: coincidentally these aspects happen to be a significant focus of the Farina project; whether by design or default is unimportant to the many travellers and visitors to the site; but there is no doubt that the incentive of food is high on the agenda. 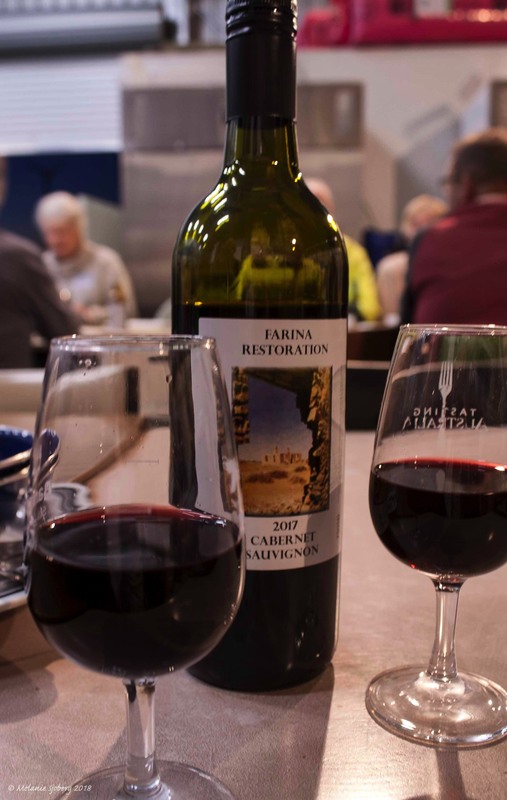 The decision to renovate and get the underground bakery operational has generated a boon for Farina and it is apparent from talking to visitors that word has spread far and wide. The bakery itself attracts interest in its design and some with curiosity as to how the underground scotch wood oven functions. Children are especially intrigued by the baking process and leap at the opportunity to see firsthand how it works. One young boy helping a volunteer carry a tray of freshly baked goods into the café then told his parents that it was the “best” bakery he had ever seen! 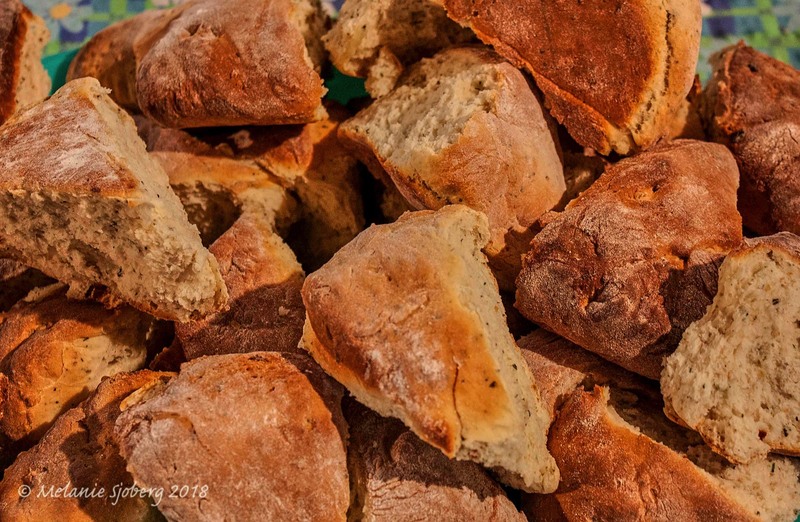 The tempting array of loaves and bread rolls catch the eye when you walk in. Your gaze skims across to the glass case packed with a selection of sweet scrolls, vanilla slice, chester square and cream buns that seem destined to undermine any willpower to exercise restraint. Before you can resist you’ve been drawn to the warmer loaded with various pies and pasties. 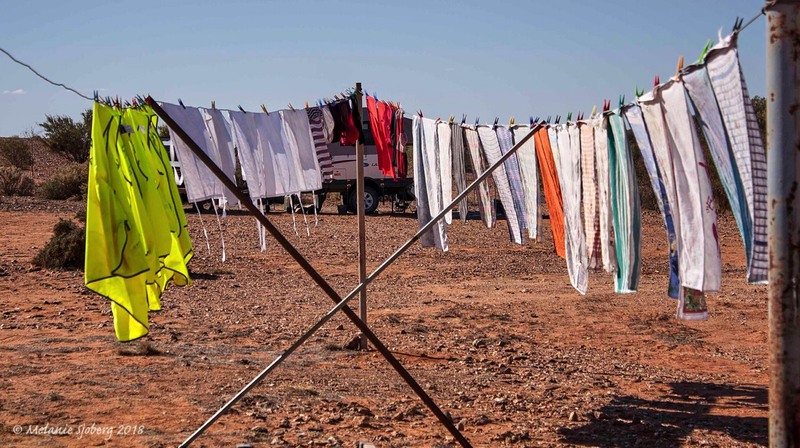 I don’t think I’ve eaten a match (puff pastry, jam and cream) since I was about 10 and I expect many visitors experience a similar reversion to childhood when confronted by this display on their outback trip. Sunday found the main street lined with so many cars, campers, vans and people that Joe jokingly suggested he take on a new role as traffic inspector. 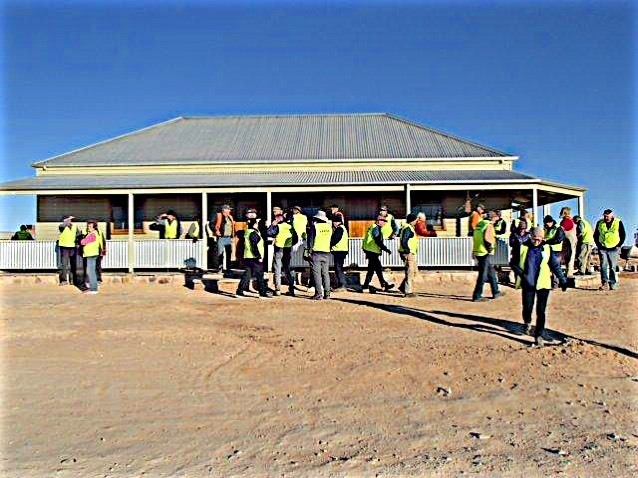 This only intensified the next day as volunteers were inundated - serving bread and pies that rushed out the door faster than the baker could produce them. 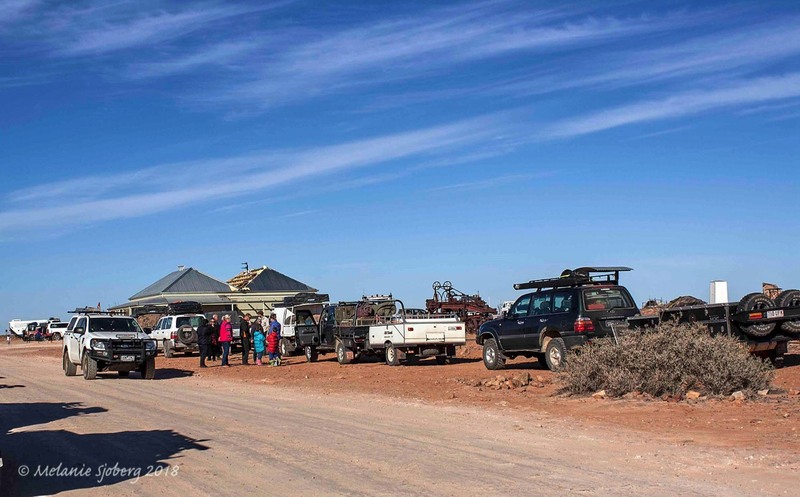 School holidays and huge numbers of people heading to the Marree Cup and Birdsville Bash bode well for the bakery turnover. The queues commence no sooner than the bakery opens at 8am, relishing the delightful aroma of warm loaves and then it is like the never-ending story as the room refills with eager tourists prepared to wait if necessary until the next batch of buns appears. The benefit of lingering around the bakery and coffee machine ensures that there is an opportunity for visitors to slow down, have a coffee, chat to volunteers about the town history, identify points of interest and wander the site before stocking up and moving on. Stepping out from the bakery, visitors look directly across the road to the Transcontinental Hotel that appears to have been a splendid sight in its day. 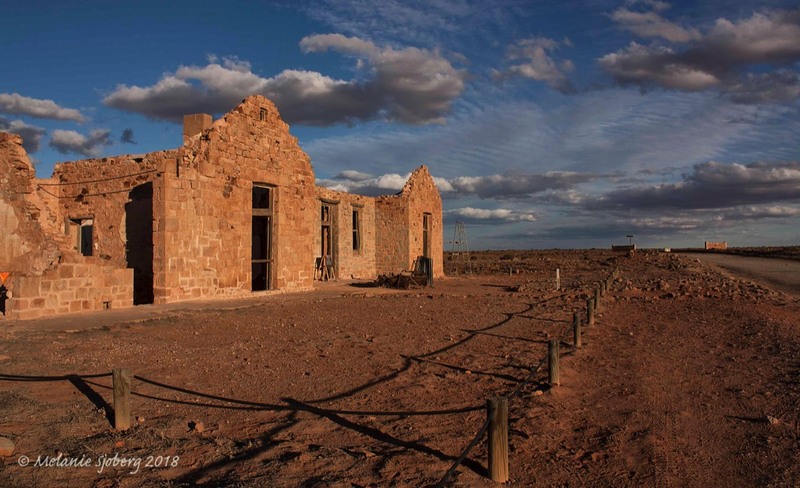 You can imagine this hotel as an alluring stopover for the better-off budding SA settler on a business or long distance train trip, but perhaps at the peak of summer even the solid stone walls would have failed to relieve the intense heat. 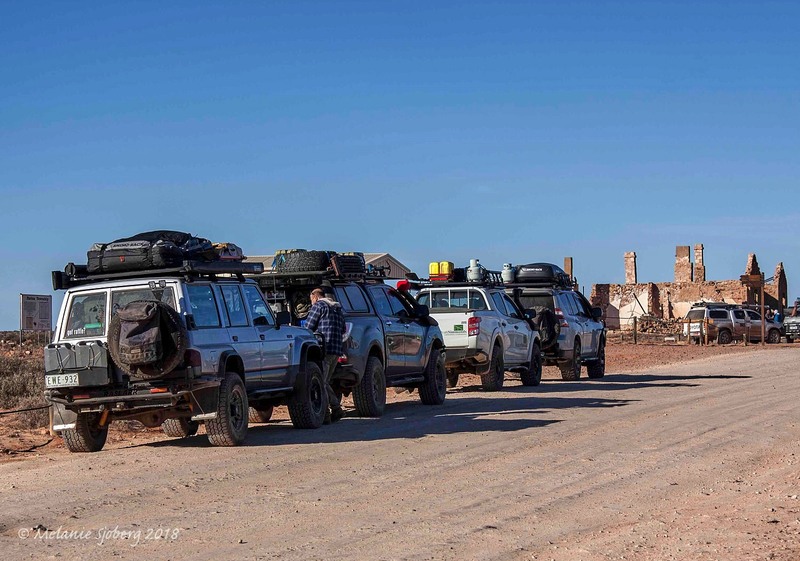 Well-dressed gentlemen or ladies in long frocks were not able to hail a taxis or uber so perhaps we should pause to consider how they managed a walk along the dusty track or hopping aboard a camel or donkey as the hotel is not conveniently placed next to the train line. 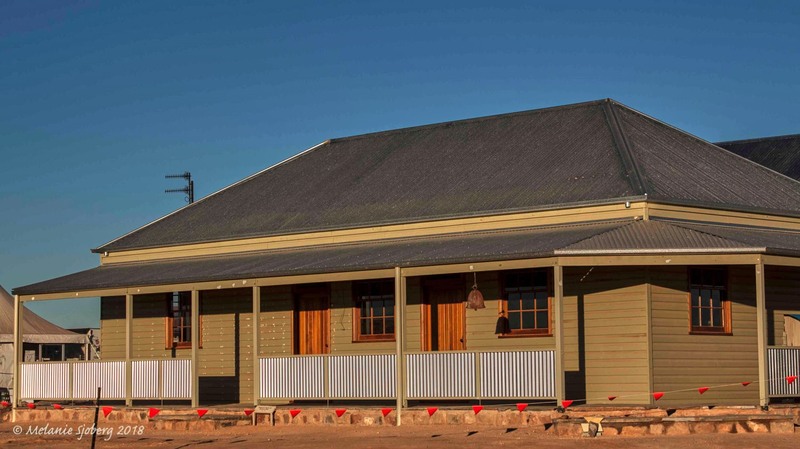 The visual trajectory then draws visitors down the main street to the story boards and further along a flash of bright green appears - which is a flock of volunteers rather than parrots - patiently and painstakingly shoring up the beautiful sandstone of the old post office. A glance down to the east finds a further gathering of green-clothed volunteers mixing “mud” to re-point stones on the police station. 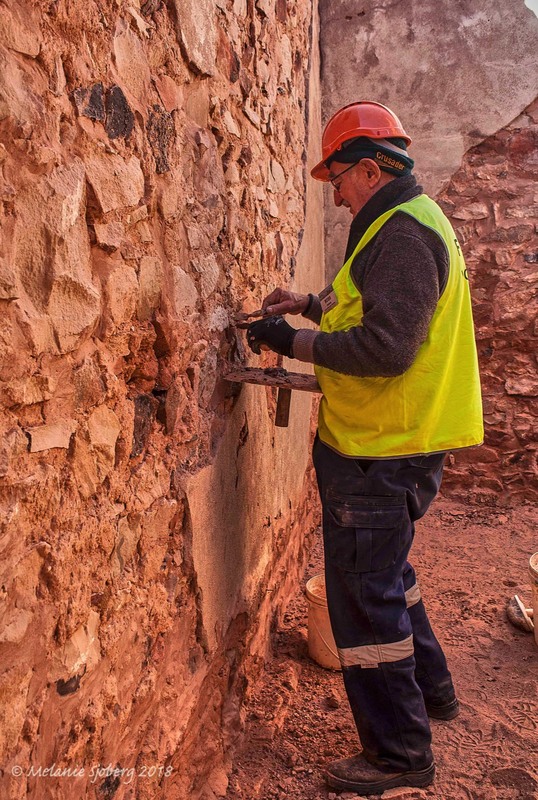 This is one of the more important features of the Farina project that has many volunteers teamed up to resurrect and stabilise some of the main town buildings that had fallen into disrepair or in some cases collapsed into a pile of stones. 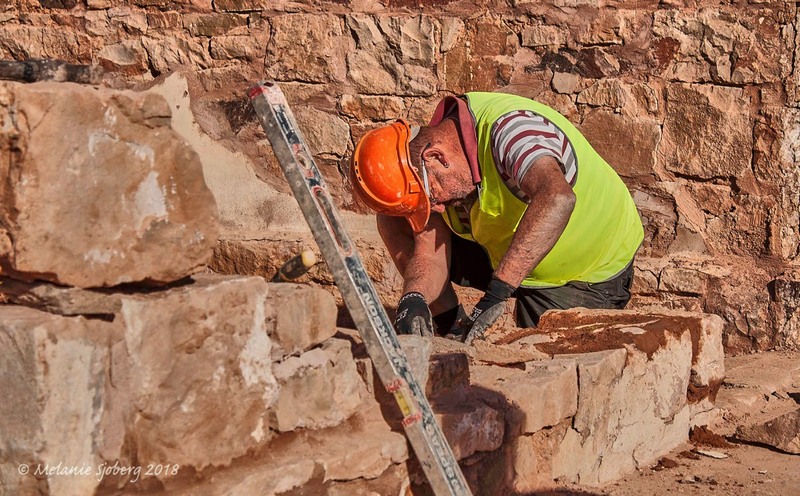 Experienced stonemasons are on site sharing their knowledge and skill about the traditional methods of stone-pointing with willing volunteers who may never have touched a brick or stone before. 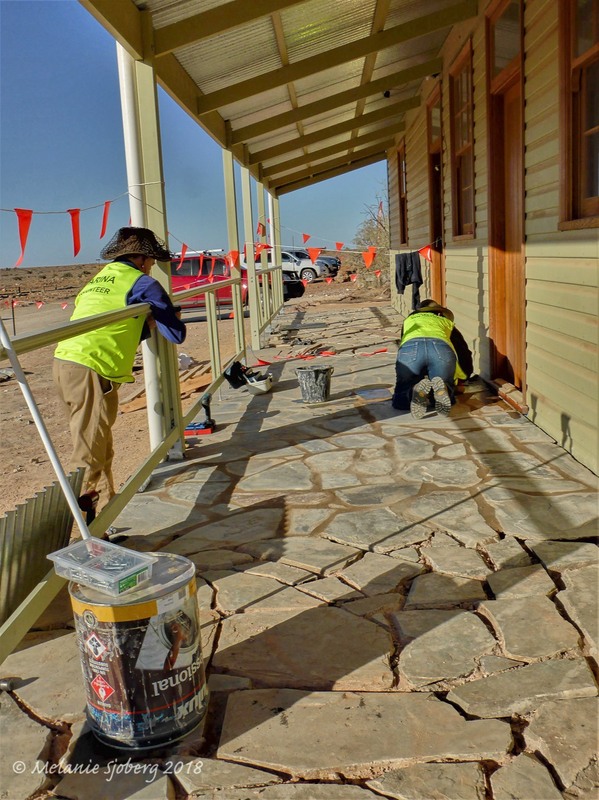 Volunteers come with a variety of trade and professional backgrounds but irrespective, many seem to have become enchanted with the fine detail of tracing mud mix in between the stone to hold them firmly in place. 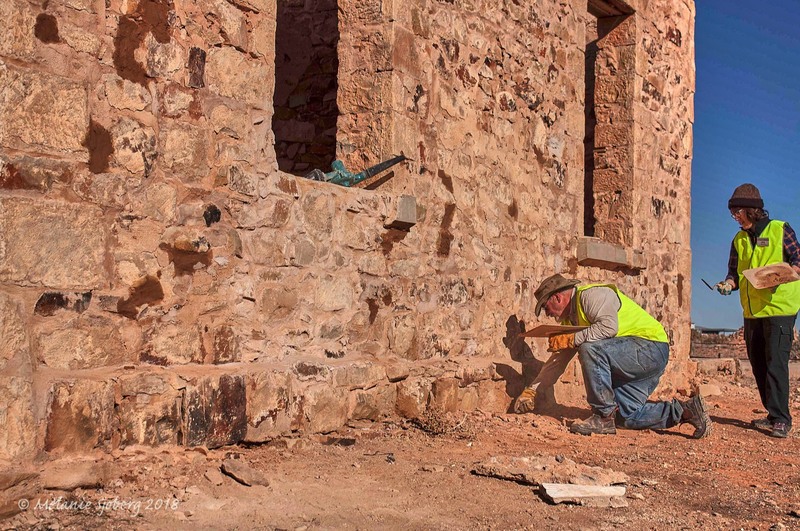 The work harks back to early settlement when stonemasons must have battled the harshness of the extremes in this climate; that finds biting cold winds roaring across the gibber plains, freezing overnight temperatures and alternatively the hot desert sun up to 50 degrees searing into the buildings. My personal favourite is the Exchange Hotel which can still be imagined amidst its frontage, defined centre hall and a few half built walls. Smaller walls outline several rooms that would likely have been bedrooms and a reminder that contemporary standards generate greater expectations than space enough for a bed and possibly a side table with china washing bowl if you are lucky. 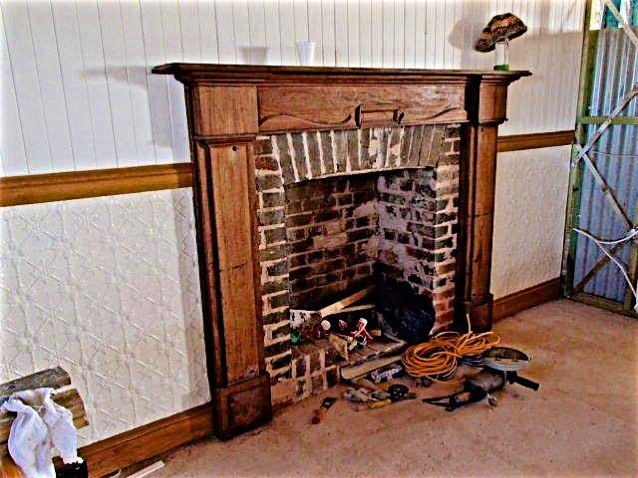 Toward the back, the fireplace and chimney suggests a warm kitchen area and across the yard remnants of stables. The stones set in various shapes throw off beautiful gold and rust shades as they catch the diminishing glow at sunset. 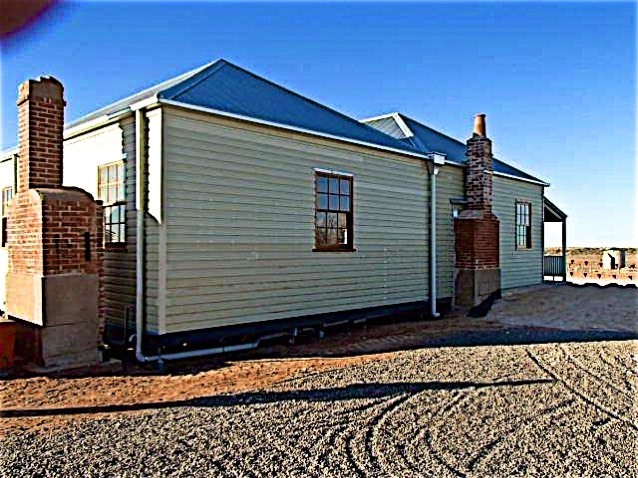 Of course, many of the towns people throughout the late 19th and early 20th century occupied dwellings that were simpler construction of wood, canvas, tin or bark so it is understandable that they have disappeared. After the final residents vacated in the 1950s and 60s any remaining buildings were left to the vagaries of climate and passersby who may have garnered materials to repurpose; there are nonetheless items scattered around the site that remind you of that earlier life so roaming the streets will still deliver fascinating insights. First to riser for the day… the oven is hot, and the first batch already rising (as is the sun). The Main Street at Sunrise. Farina shakes off the night ready for another day. The visitors begin to roll in..
And head for the bakery and it's hot bread - and maybe some other "naughty" stuff with the coffee. Very hard to make a quick decision! Work begins in earnest with the never ending re-pointing of the ageing stonework. No end to the pointing work. One learns new skills (or invents some in this case! These fellows are working in the shade - in the mornings that means that they're probably quite cold. Transcontinental Hotel after all the hype for the day is over… The old girl "beds down" for the night. Lock up! To secure, to prevent access, something hard to open. 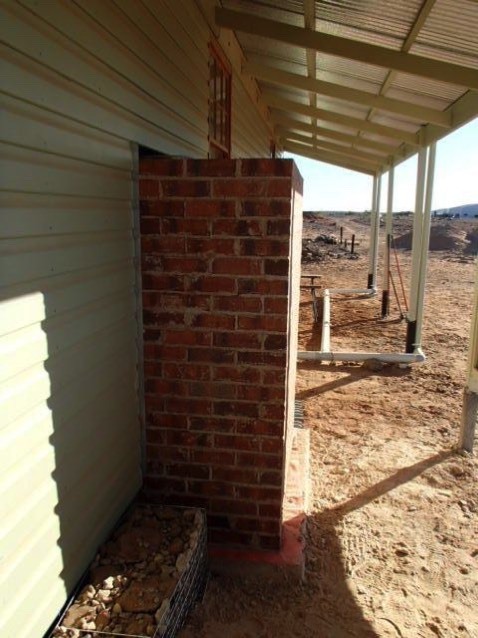 When applied to building terminology we learn that it is the stage of a project where the main structure - external walls, roof, doors and windows are in place so that the structure is capable of being secured. It is a significant step in the construction of Patterson House and has been achieved ahead of expectations. Steve, project leader proudly announced that this signifies the completion of stage 2. 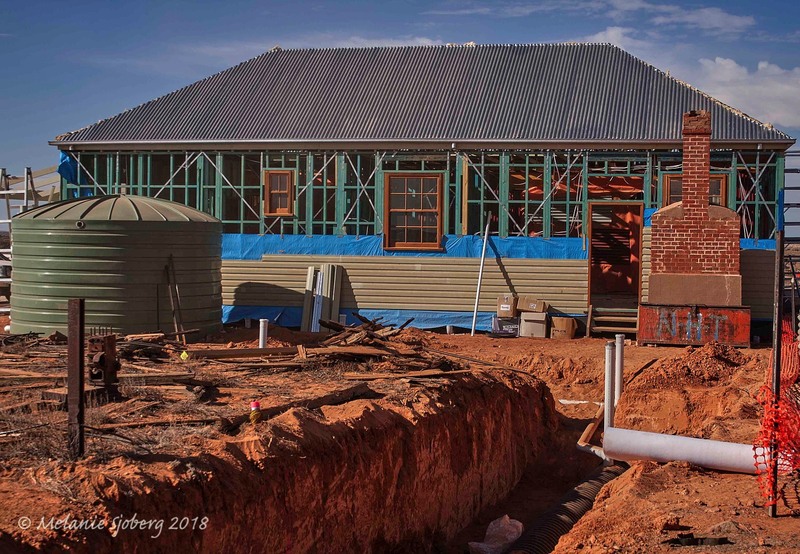 It also means that the building is ready for a team to start on the next stage called “second fix” - that work will incorporate internal fittings, flooring, installation of wet areas etc. 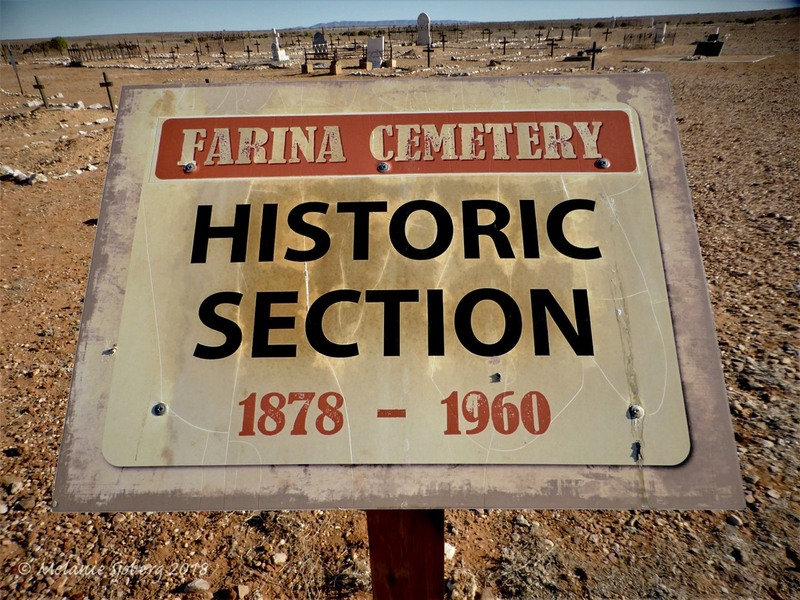 The Patterson family were central to the life of Farina, living here from the 1920s to early 60s. Rob Olston’s short book covering stories of Farina outlines the Patterson’s role in running the Farina station, a local store and apparently holding dances on a specific surface out back of the property. 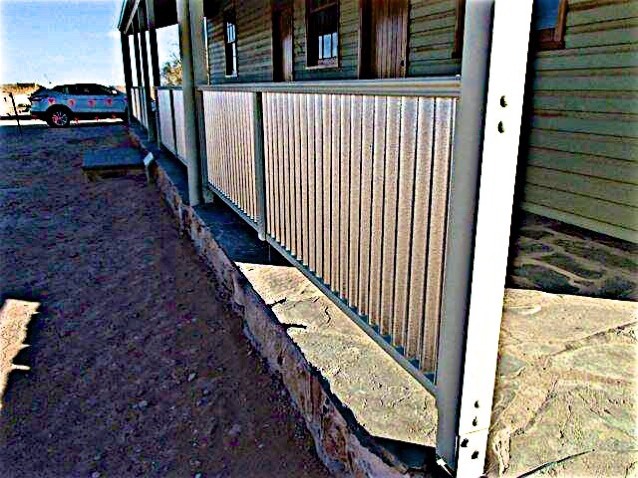 Early photos show the Patterson family home as a corrugated tin clad structure with a long front verandah and small fence that was still standing up to the 1970s. 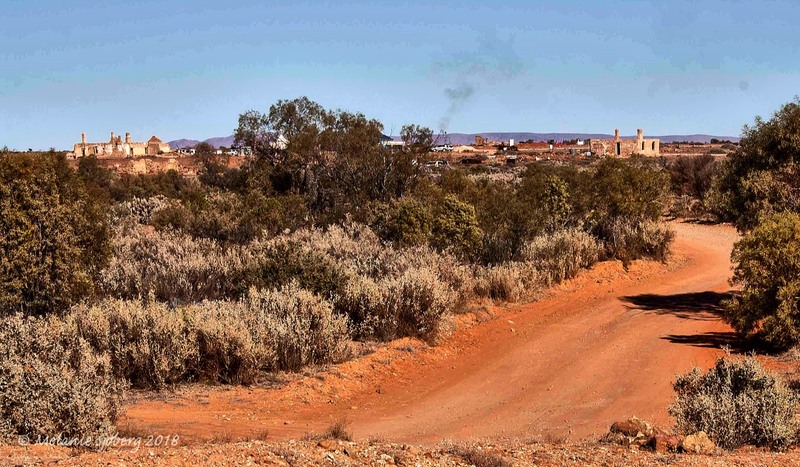 More recent photos from 2005 show that the Patterson site was flattened; comprising some broken foundation amidst random timber offcuts, rocks and rubble, saltbush, scrub and piles of sand. The Farina project aims to capture the original style; although within limits set by the need to conform to current building standards. 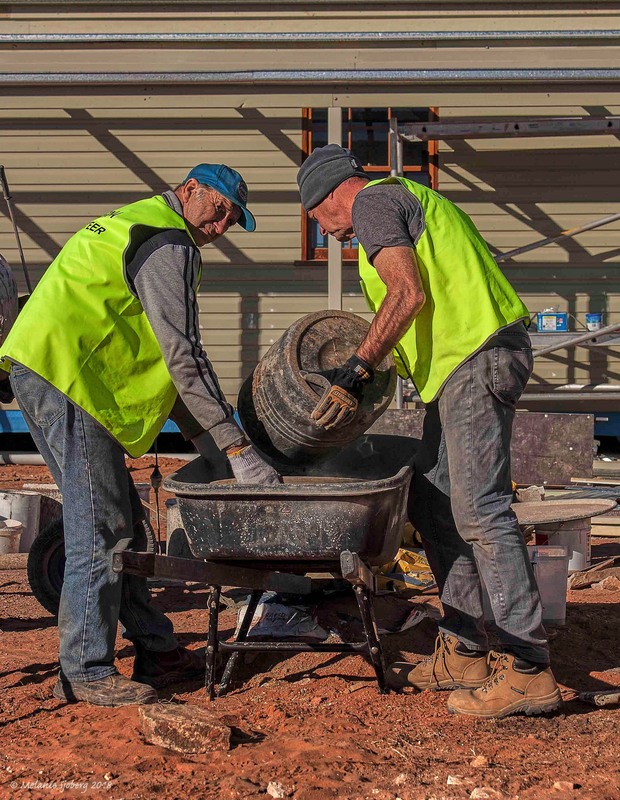 Whatever background, skills and interests volunteers bring to Farina, you are quickly exposed to many different aspects that reflect the variety of functions necessary to keep the site operational and advance the key projects – much like the town residents must have pitched in wherever necessary during its formative stage. 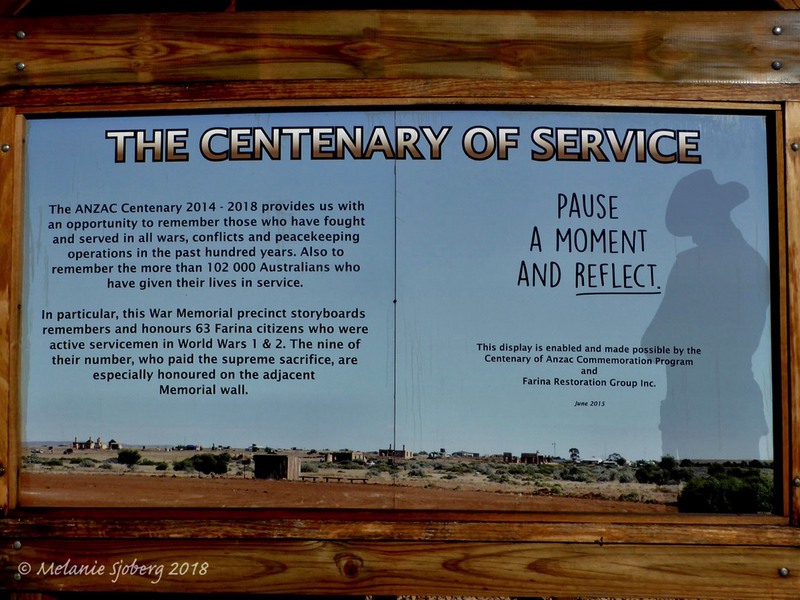 There are days when it must seem as if the volunteers are rediscovering the challenges of building one hundred years ago, as a dust cloud spreads through or the sun glares down even during July. 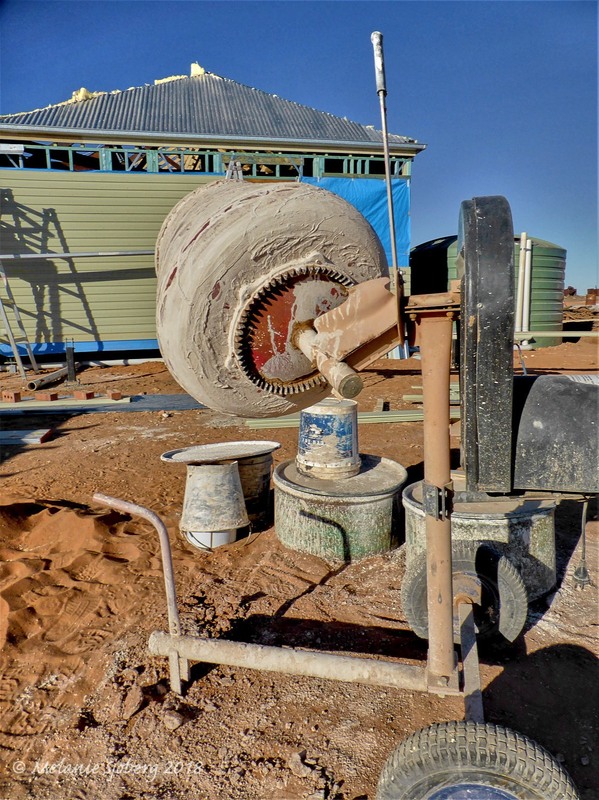 On the other hand an excavator, solid scaffolding, large generator and power tools must make many aspects of the current tasks more efficient. 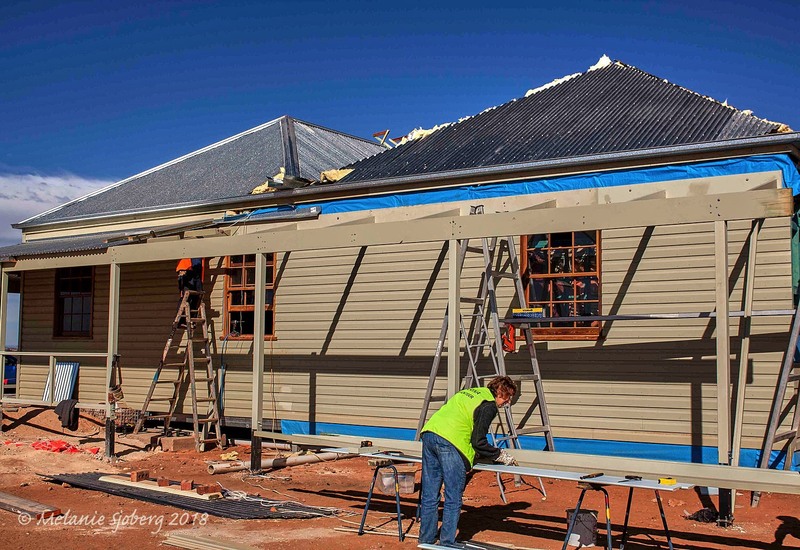 A large cohort of green-clad volunteer tradies and assistants have buzzed around the Patterson building over the past weeks making a huge contribution to this achievement. As long as people have been willing, there are tasks to be done. Once the main frame was completed, volunteers spent many hours priming and painting timber panels for the external walls; others assisted the stonemason sealing and cleaning the slate for the verandah and steps. A team of skilled roofers were essential to making the building weather proof and its wondrous shine now makes you blink from some distance. 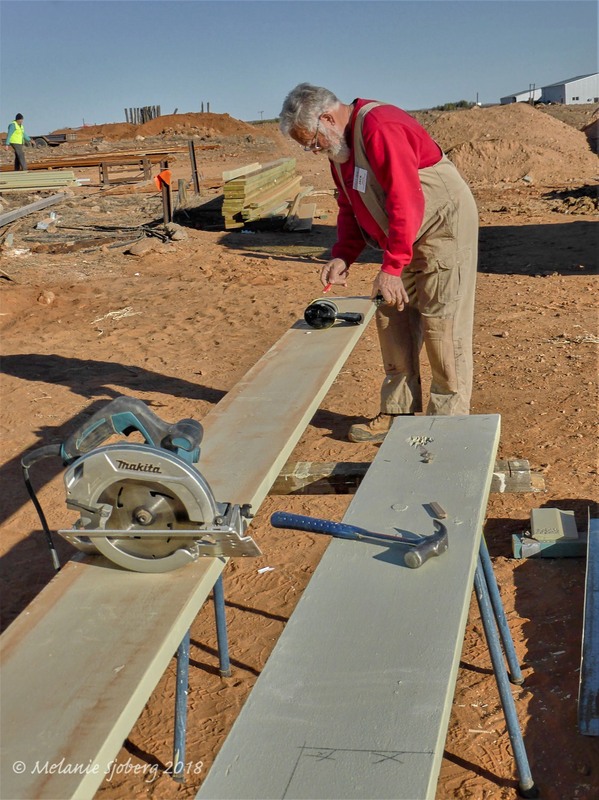 Steve the project leader exhorted volunteers to extra effort during the past few days as the building was really taking shape. 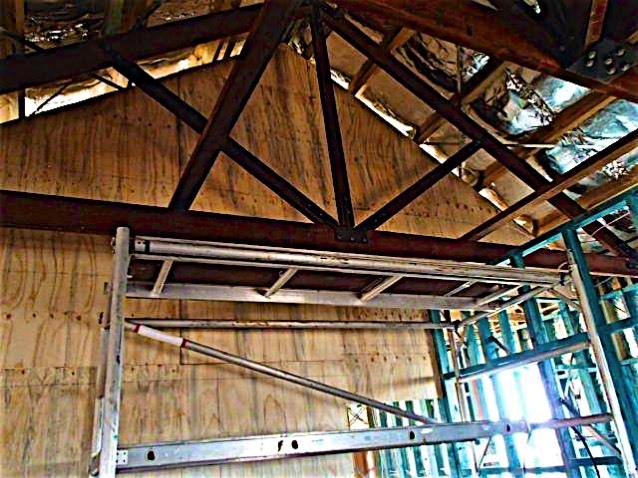 We could all see the changes as sections progressed: long timber panels gradually climbed the walls and the two roofs were joined. 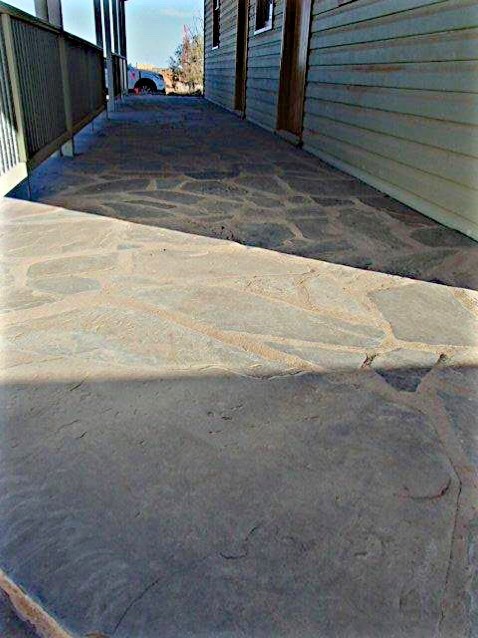 Enthusiasm spread as the verandah railings took shape and the complex puzzle of slate paving was painstakingly laid, grouted, cleaned and polished. 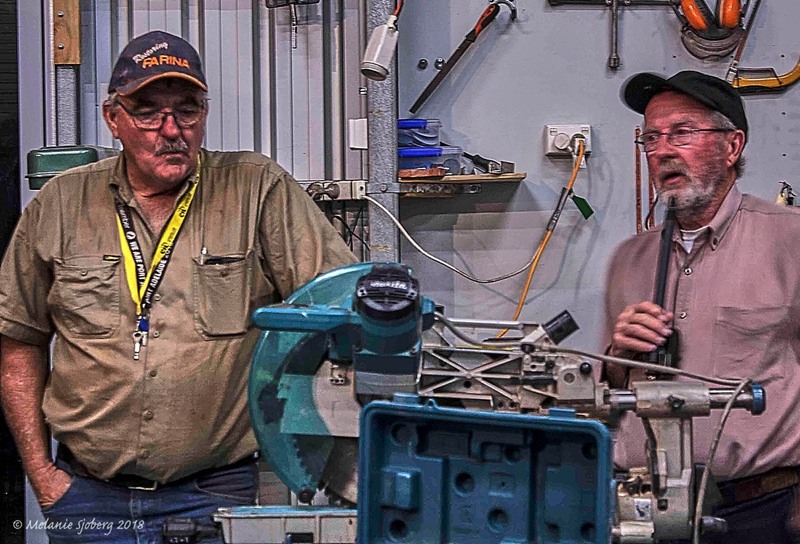 With a cheeky smile on his face, Steve proposed to triple the “wages” if the job could be ready for lock up by Wednesday – of course the volunteer crew could figure the maths 3 x 0 = 0 – but were energised to deliver regardless. 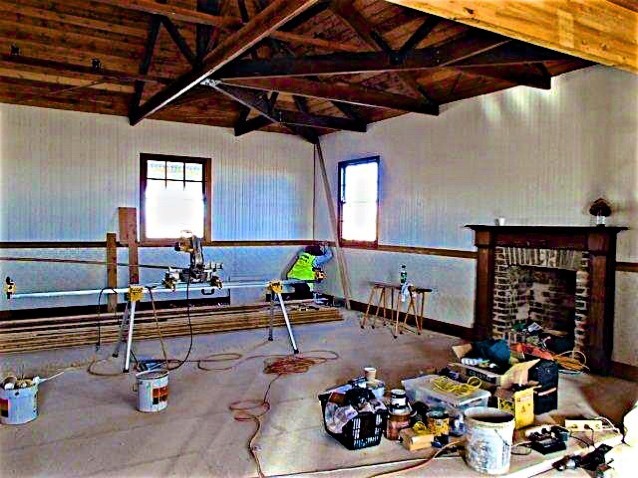 Patterson’s House will eventually become the focus of a new café area, along with historical displays, museum and educational space. 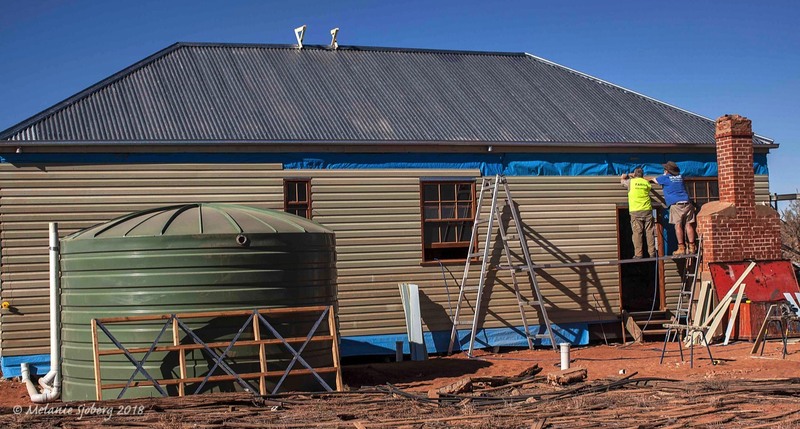 The new building will operate a much larger kitchen than the Patterson family enjoyed, with gas stoves an advance on wood, and with plumbed water rather than carting it from an old tank. While not operational, an old…..stove has been resurrected to provide an example of the domestic challenges of those early years. Power supplies will come from solar and back-up generator, which will offer more reliability than the family experienced sitting around hurricane lamps. 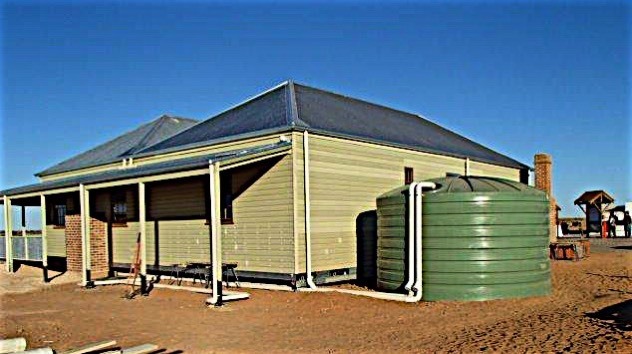 And with septic tanks installed, volunteers and visitors will also have access to an internal toilet flushing facility; unlike the original house with its external long drop style toilet, possibly requiring residents to be careful to watch for goannas and snakes as they traipsed across the dusty ground. Perhaps one of the more emotional aspects of the Patterson lock-up celebration was the presence of Joe and Mario. 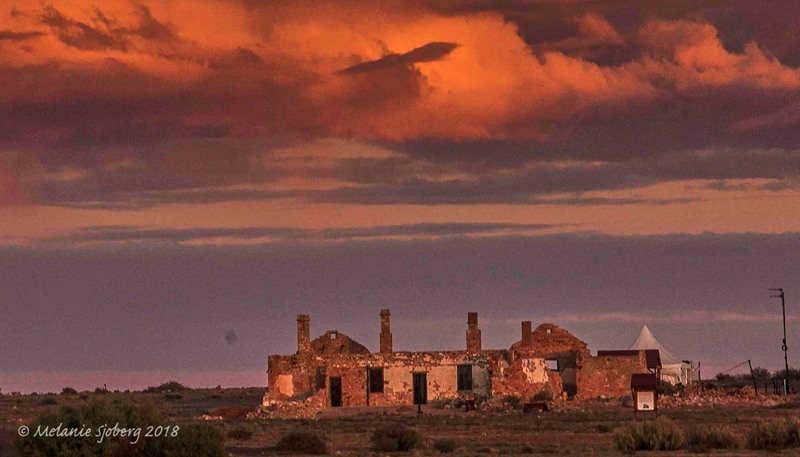 Now in their 70s, the two brothers had spent their early years in Farina and have fond memories of playing with the Patterson boys in the old house. Joe and Mario have been volunteering at Farina and bringing many interesting stories to the nightly campfire. 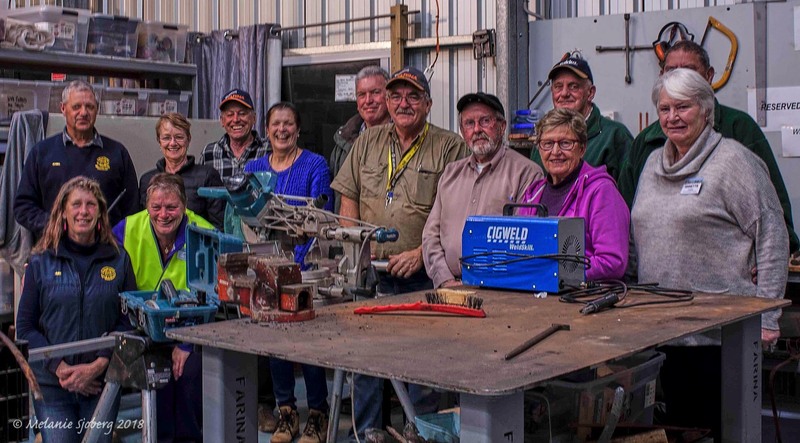 An added boost to the volunteers came at the Wednesday night roast when the Wimmera 4WD Club presented a much needed circular saw to Farina Restoration Group to continue their work on site. 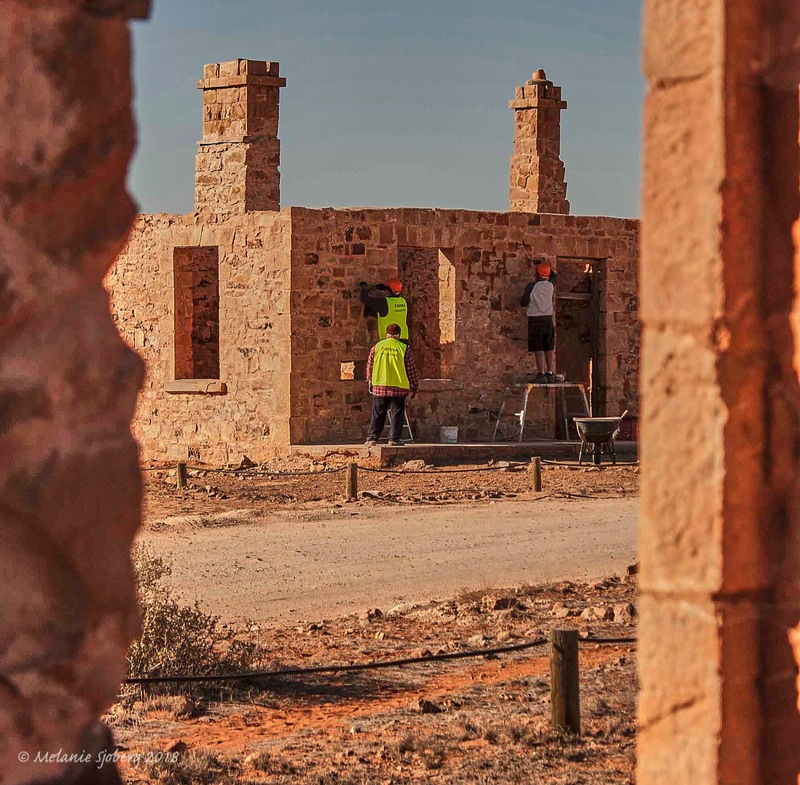 It is quite clear from return visitors that the achievements of the Farina Restoration Group to date are testament to the determination and dedication of its many volunteers and supporters who value the vision to preserve part of early settler history in the far north of South Australia. Last minute cladding being added. There's always rubbish bins to empty. And clean linen for the kitchen. 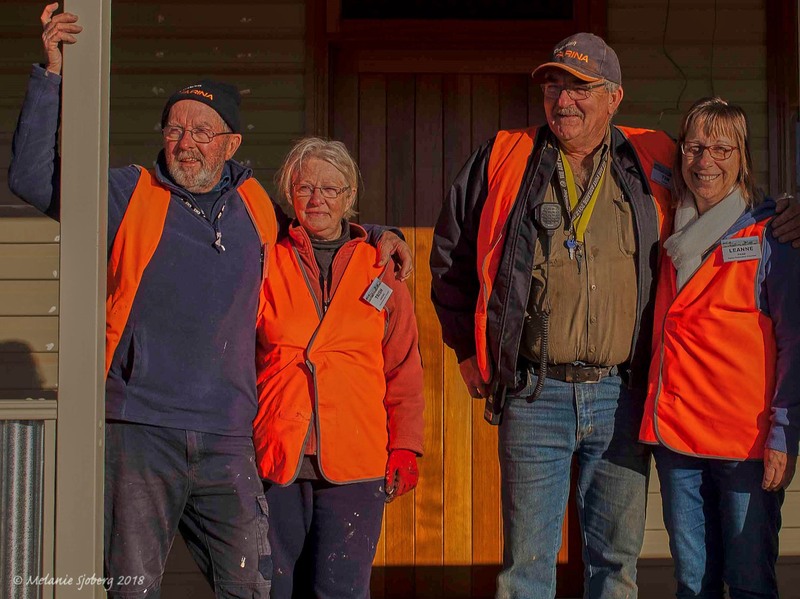 The team of volunteers for week 6. 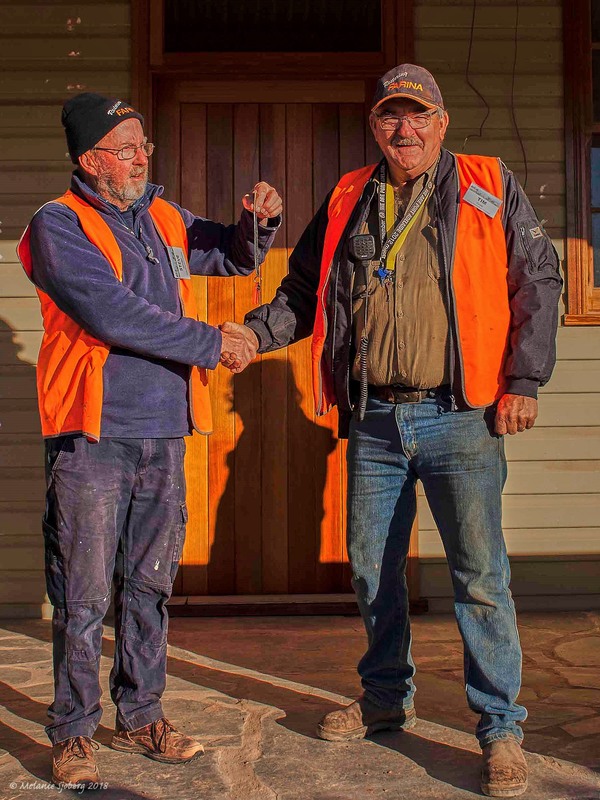 Steve presents the key to Tim. Project manager Steve and Pat with Team leaders Tim and Leanne. Ans still more mud to mix. And no end to painting. Time for a well earned celebration drink. A few images from Steve Harding (Project manager) that he shot before leaving at the end of Week 6.